In April, police removed two Mohawk teenagers from a campus tour at Colorado State University. By now the video of officers removing Lloyd Skanahwati and Thomas Kanewakeron Gray after a mother on the tour called 911 has made its way around the internet. She said the brothers acted “odd,” wore strange clothing (they were wearing metal band t-shirts) and were too quiet when she began asking them why they were on the tour. “They just really stand out,” the unidentified woman said in the 911 call. 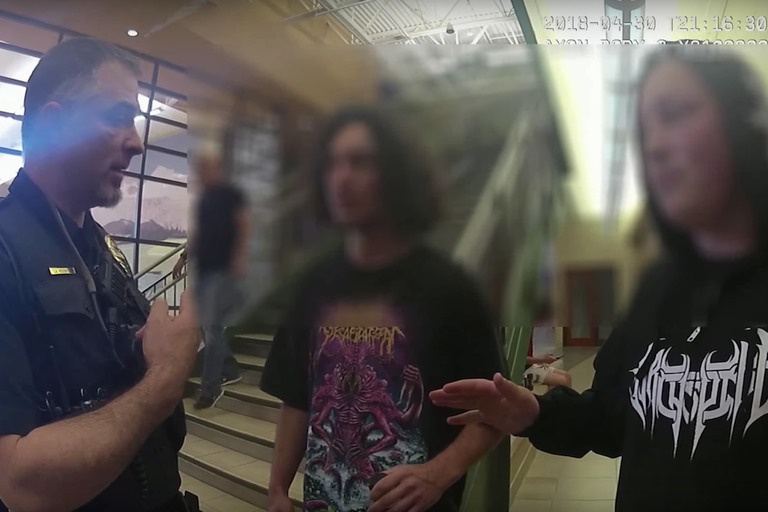 A screenshot from Colorado State University police officer’s body cam footage shows the confrontation with Lloyd Skanahwati and Thomas Kanewakeron Gray, Mohawk teens and prospective students of CSU. The university has since issued a formal apology for the incident. This particular incident hit me on a personal level. As the father of a quiet Native boy who likes his hair long and his clothing black, I saw my son in the two nervous young men in that body camera footage. And, as Associated Press reporter Mary Hudetz pointed out, the behavior of the Gray brothers was anything but abnormal. Indigenous scholars, activists and thinkers have often told me that when a tough decision has to be made, and there is no consensus, ask the quietest Native in the room what they think. They’re the one most likely to have been soaking everything in and thinking critically. For students like Nicolas Rojas, a 20-year-old Cherokee man from California, the time for silence is over, however. Earlier this month, a security guard at Marymount California University, denied Rojas access to campus when Rojas showed the man his tribal identification. “He immediately starts to get very aggressive and says ‘Don’t hand me a fake ID, I don't want this, you can leave now,’ ” Rojas told me. And when he tried to explain that his tribal identification card was recognized by the federal government, as stated on the back, the security guard refused to listen. Rojas told him that he was being discriminatory. “He said, ‘Do not use big words you do not understand.’ ” Rojas, who was visiting a friend on campus, told me he worked hard to earn a 4.0 GPA in order to be accepted to nearby University of California, Berkeley. Rojas said he uses his tribal I.D. to apply for jobs, access buildings and travel. And while it is often questioned, he sees it as an opportunity to educate people not only about tribal sovereignty but the mere existence of his people. Historically, Native Americans have not had the opportunities other races have to occupy those spaces. Native Americans represent about 1 percent of student bodies at colleges across the country, and they are the least likely to receive any form of college preparation. The Gray brothers saved money and borrowed their mother's car to drive from New Mexico to attend the tour they were removed from and ultimately missed. When Indigenous students are on those campuses they often feel isolated and misunderstood, and may even be racially targeted. And the 573 federally-recognized tribes and their members are often seen as a monolith, one group of people who share all traditions and culture, which only increases opportunities for misunderstanding or misrepresentation. Some universities have hired tribal liaisons to help Indigenous students on campus adjust, find resources, or deal with discrimination. That can ease the effects of incidents like the one at Colorado State. Carmen Lopez, director of College Horizons, organizes workshops for Native students preparing to enter college. It is important that we all create inclusive places of higher education for all people. Perhaps a good place to do so would be with the most invisible. Note: This story has been updated to reflect the total number of federally recognized tribes. There are 573, not 567.